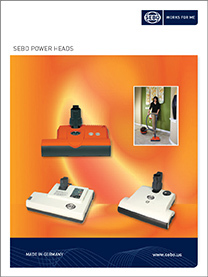 Made in Germany, SEBO power heads are recognized worldwide as the most reliable and best designed on the market. They effectively clean most types of flooring surfaces, have excellent pet hair removal and are virtually maintenance free! 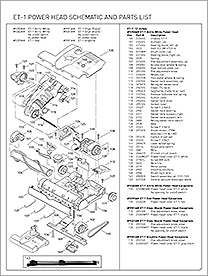 They feature warning systems that assure consistently effective brush agitation and provide automatic shut off, if an obstruction jams their brush rollers, which protects the belts, motors and carpets from damage. And removing their brush rollers is quick and easy, so they can be cleaned or replaced if the bristles are worn. All SEBO power head models can be attached to existing central vacuum cleaners as replacement units, but doing so requires the additional purchase of SEBO’s Central Vacuum Adapter (Item # 2780AM). This Adapter offers a universal fit, so that most central vacuum cleaner wands can connect to SEBO power heads. 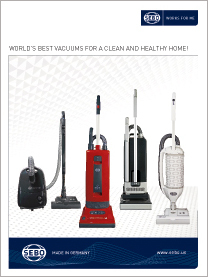 The ET-1 and ET-2 Power Heads can also be attached to the FELIX Kombi model, to upgrade that straight-suction vacuum cleaner into one that also includes power brush capabilities. 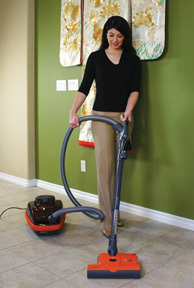 SEBO ET-1 (12 inches wide, 10 1⁄2-inch cleaning path) and ET-2 (15 inches wide, 13-inch cleaning path) – This model comes in two widths and has four-level manual brush height adjustment. It aggressively cleans carpets, but the brush roller may be switched off by pressing the green illuminated on/off button, so delicate rugs and hard floors can be cleaned with straight suction. Its amazing 180° steering ability provides maneuverability around furniture, and the extension side of the L-shaped head makes cleaning edges and under counters easy. 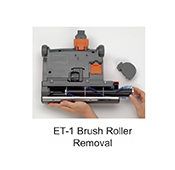 It also has easy brush roller removal, a convenient clog removal door, and an orange warning light with automatic shut off for brush roller obstructions. This prevents the belt from breaking and protects the motor and carpet from damage. Its warning light also remains illuminated during use when brush height is set too high for optimal cleaning or when the brush should be replaced due to reaching maximum bristle wear. The SEBO Central Vacuum Adapter – This device fits on any SEBO power head and can attach to most existing central vacuum wands.